Presenting Wabi-Sabi, a project culminating in an exhibition and book by Damien Drew. With each step water sloshed between my toes—socks waterlogged with rain. 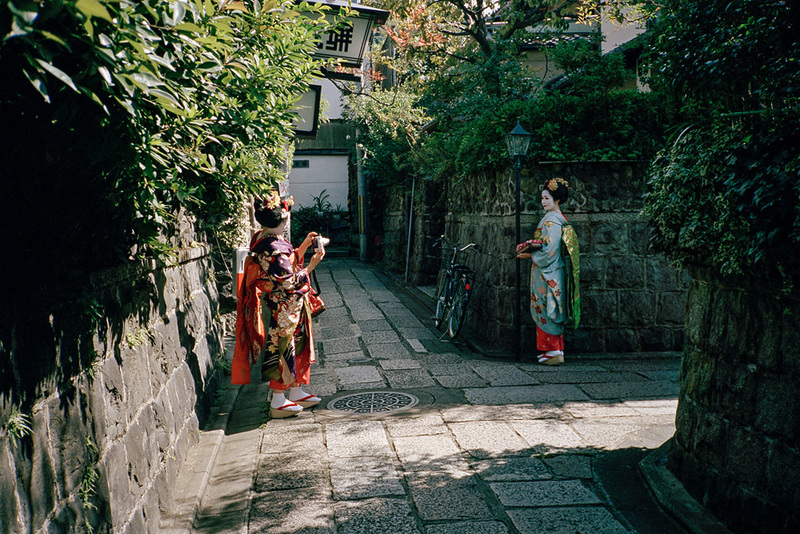 The streets of Yanaka were empty save for the odd umbrella-bearing ‘obachan’ clad in a raincoat. A typhoon had been steadily drenching the city of Tokyo all day long, but Damien and I were not to be dissuaded. 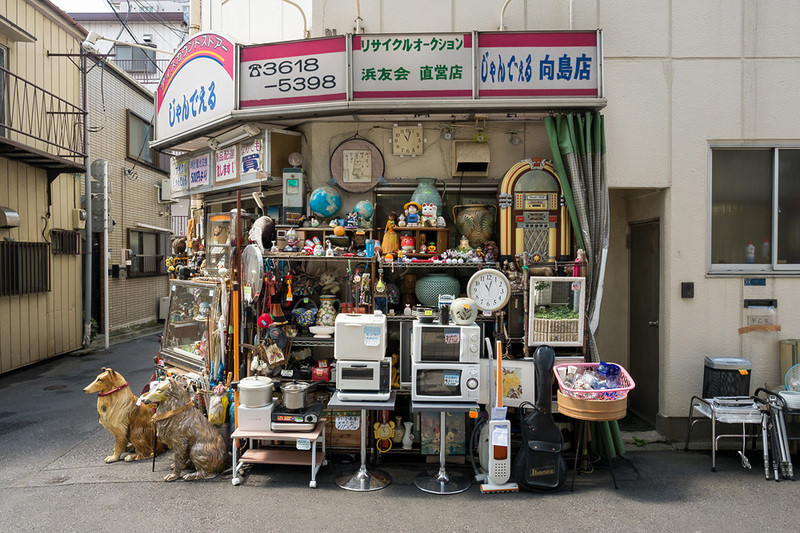 A few weeks prior, Damien Drew approached EYExplore with a special request: explore the less traveled roads of Tokyo and capture the forgotten. Old shuttered storefronts, torn awnings, dilapidated facades—the aesthetic of a time long past—this is what we sought. Damien had done his homework and came prepared with a checklist of dingy neighborhoods well off the tourist tracks. 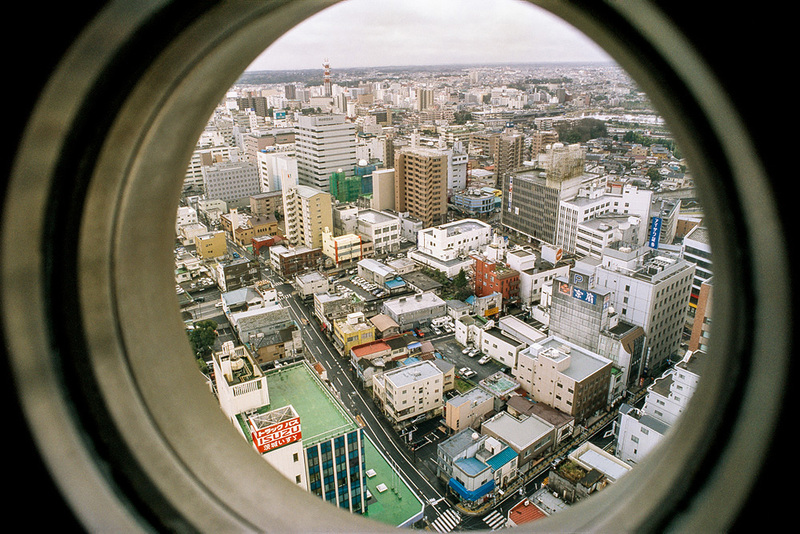 Together we crafted a course that would take us on a journey from Zoshigaya, through north Tokyo, down through the Shita-machi and ending in the Ginza-Shimbashi area. It was a perfect plan—except for the weather. A typhoon was passing over Tokyo on our arranged date, but without the freedom to reschedule, we persevered. 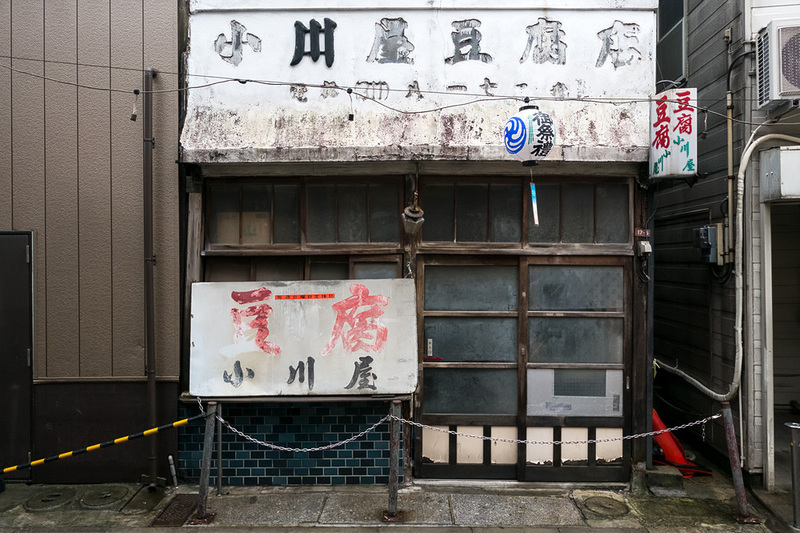 Despite making us suffer, the rain and the overcast light bolstered the mood that we found in the old streets and alleyways of Tokyo. Rain poured off eaves and clouded windows glistened in the overcast light beneath the typhoon’s clouds. The atmosphere sympathized with the urban environment we aimed to capture. This was in September of 2015. After nearly a two-year gap I finally heard back from Damien, delighted to see that he had compiled a book and staged an exhibition based in part on our day exploring Tokyo together, though he went well beyond what we found on that day. I’ve had the pleasure to interview Damien about this project. Please read on! What made you set out on this photographic journey? 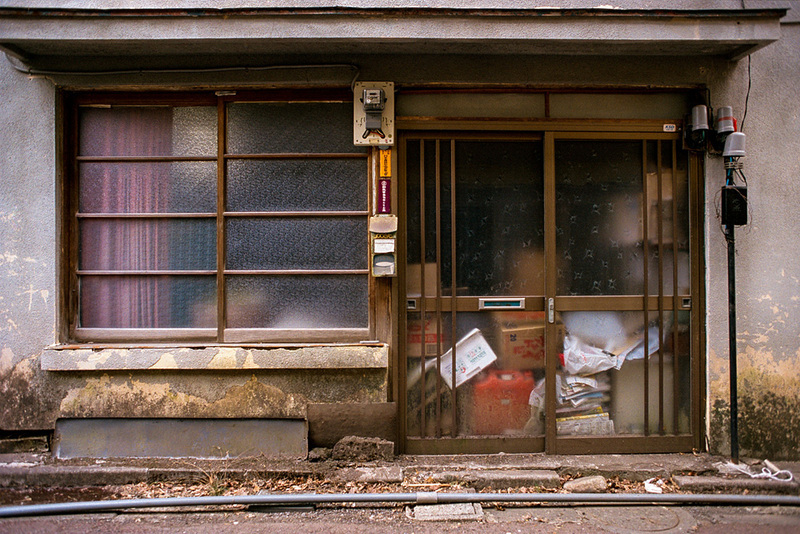 I first travelled to Japan during spring of 2006 and was immediately struck by the contrast between the hyper-modern technology-focused cities and the remnant facades that were scattered amongst them. I journeyed around Honshu and its islands on subsequent trips to discover whole towns, their schools deserted and their factories silent. Many appeared to be closed for business, their shuttered streets sitting quietly. As a solo traveller I found this stillness deeply affecting. I felt I was witnessing the passing of greatness, vibrancy and beauty and it was very moving. I had a strong desire to capture the beauty of these towns in decline, in part to document them but also to celebrate them. I was driven by a strong desire to preserve their memory and to share this photographic narrative with others. I learnt that this decline was due in part to education and employment opportunities drawing young people to major urban centres and with an ageing population these rural townships had fallen into neglect. I also witnessed pockets of these buildings in Tokyo and Osaka as people were increasingly drawn to the modernized shopping districts. As for my photographic journey with EYExplore Tokyo in Sept 2015, I wanted to draw on your teams local knowledge to seek out more of these urban treasures. Did the ‘wabi-sabi’ concept color the work from the beginning or did it come to you as the project went on? The ‘Wabi-Sabi’ concept evolved out of a basic understanding of the aesthetic philosophy from my Architectural studies at University back in the 1990s. It was not until I read Andrew Junipers ‘Wabi-Sabi : The Japanese Art of Impermanence” however that it became clear that the Japanese people might instead consider Wabi-Sabi as encapsulating an emotion that finds value in the imperfect and temporary beyond appearance. As I read the following quote I felt the author had captured the emotion, powerful stillness and quiet beauty I had experienced in these towns. I later came to title my series and book project by the same name. When we met, I recall that the focus of the project was more specific—old storefronts and facades—but I see that the project’s scope evolved. What led to that decision? When we met in 2015 I was looking to develop the body of work I had begun in 2006. I returned in 2016 also to shoot further afield. 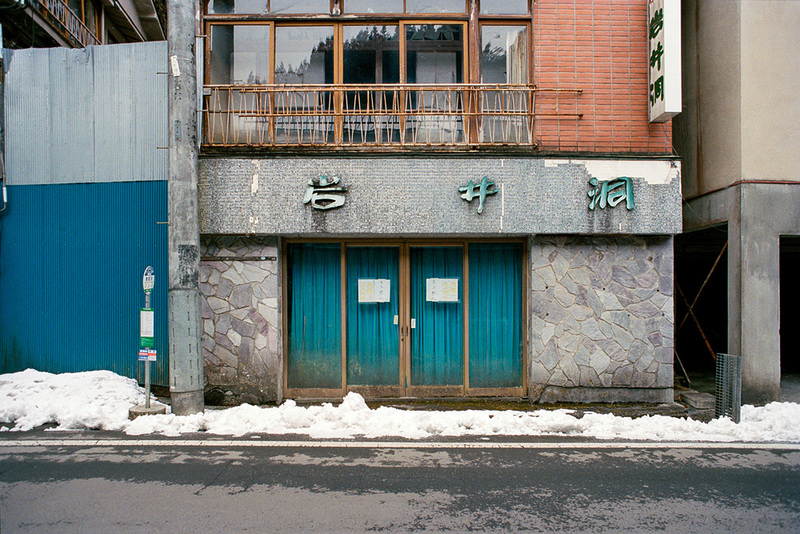 You are correct though, I had amassed a series of over 500 shop fronts from 11 prefectures by this point and it was my primary focus. 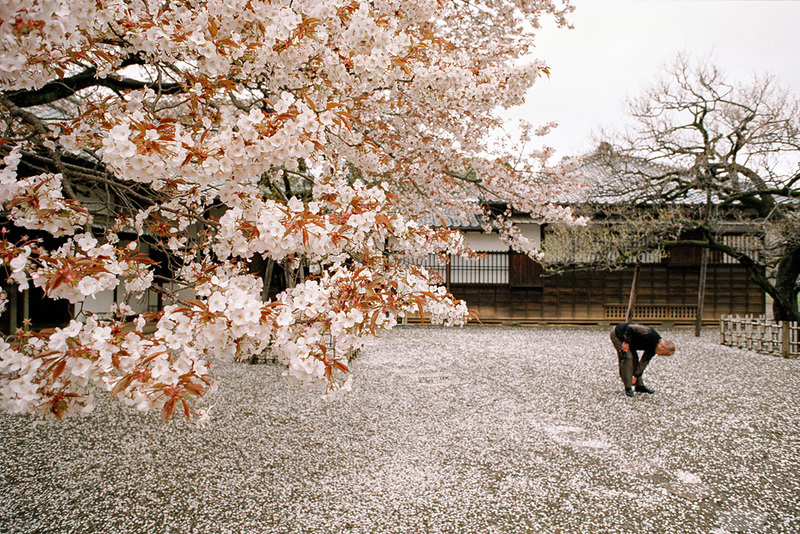 As I began the edit for my show and book I considered many non-architectural images I had taken in Japan in this 10-year period, some of which illustrated the social issues I touched on earlier. Others clearly established a conversation with the architectural images that spoke to the central concept of ‘Wabi-Sabi’ within a broader context. I made the decision to explore the theme more widely and in the edit paired a shop front with a less architectural image. I am hoping the viewer might consider details and qualities in these paired scenes that may be inconspicuous, congruent or contrasting, in the knowledge that all is passing. In a world that is increasingly homogenised through global retail chains, the air of neglect, the history and the unique character of these streetscapes belie a rare beauty. 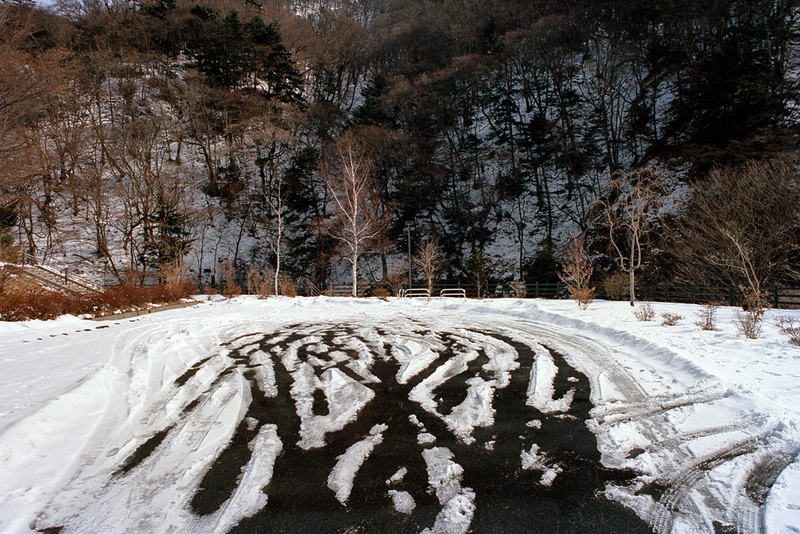 These images seek to document that which is temporary and to celebrate its beauty in turn. It is important to me to share this story with Japanese people as a guest in their country. The book is printed with both Japanese and English text for this reason. Regarding technique, what did you keep in mind during the project? Did you give yourself any constraints? The only constraint I imposed on myself was the front-on ‘elevation’ style framing of the shop fronts and building facades. My earlier show and accompanying book ‘Everywhere was wherever’ explored my fascination with what I see as a loss of a ‘sense of place’ and texture and its rapid replacement with a generic built environment. This project was captured on an 18-day motorcycle trip from Miami to Los Angeles. I applied the same front-on style framing in the ‘Everywhere’ series to emphasize the set-like quality of the facades. It felt to me as if they were sets for films that were not yet made. 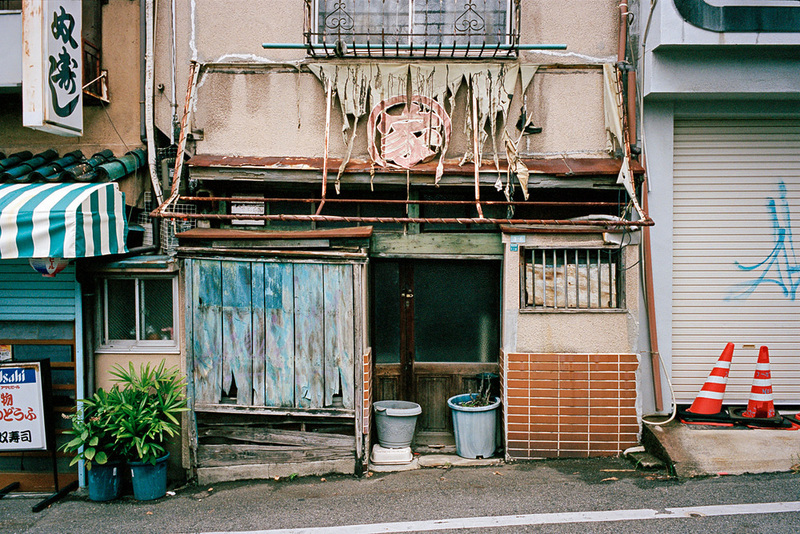 I felt this was also appropriate for WABI-SABI with the added sense of honoring and celebrating these remnant facades. In contrast the paired images are more loosely framed and organic in nature. Our readers are eager to develop their own projects. What advice do you have in regard to creating a body of work such as this one? I think any project is worth developing if it can move people or invite people to engage emotionally beyond an appreciation of simple aesthetics. A photographer friend said to me a long time ago “don’t try and capture the object, or person; capture how it feels”. Find a thread that excites you and shoot it over and over, shut out the voices, don’t ask for scores of opinions, back yourself and dare to put it out there. Develop a story you are passionate about sharing with others. Lastly, be mindful in the age of social media that it is very hard to retain agency and authorship over an idea for a project once images are shared with the world digitally. Go analogue and make a book or stage an exhibition! There is nothing quite like seeing your vision in print. The creation of a book must be an arduous endeavor. Can you tell us a bit about that process? The book was the focus of the WABI-SABI project. It contains 96 images, 48 pairs in conversation. The most difficult part was settling on the edit, and likewise only sharing 30 of these images in my current show at Black Eye Gallery in Sydney. The process started with laying out over 300 6” x 4” prints on a large table and looking for the strongest images and the pairings that best spoke to the WABI-SABI concept. Once I had a selection of around 100 images I then packed them up and didn’t look at them for a couple of weeks. This distance helped me discern the better images. I then set to scanning the 35mm negatives which comprised approximately half of the book and show content. Over the years I had shot with a Canon F1N, Contax T2 and Leica M6TTL. 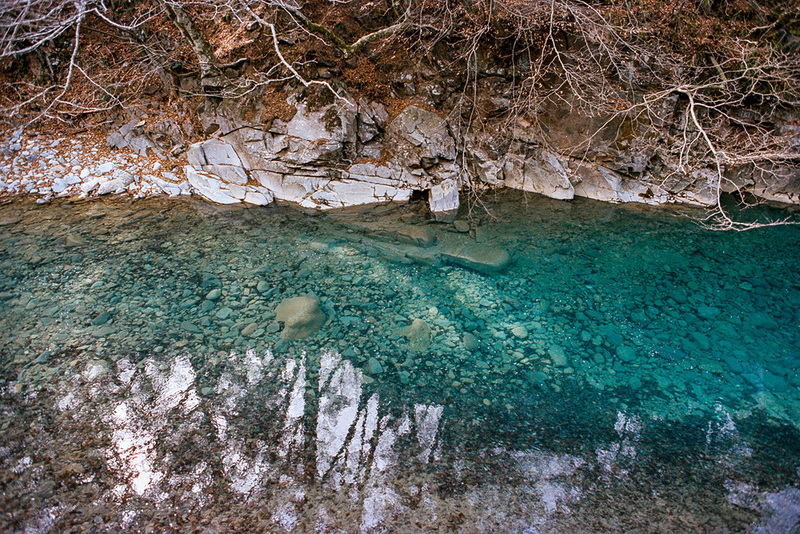 The rest of the images were taken with the digital Fuji X-Pro 1. After consolidating the final pairs, there were many hours of retouching and color balancing, sequencing, typography, paper selection, print proofing and sampling of materials and custom de-bossing for the Kanji stamped cover. I did all of this with the exception of the Japanese translation by my dear friend and fellow Japan-phile Alison Rawling. Momento-Pro in Sydney is fantastic for photo book self-publishing and Geri Farr worked closely with me throughout this process. There are 100 signed and auditioned copies only. It brings me a lot of joy to have sent over 50 books to the UK, Japan, Malaysia, Australia and the USA and to hear that people are enjoying it. I’m hoping to get it formally published and share the story with a wider audience. Damien’s exhibition runs from September 5 to September 24, 2017 at the Black Eye Galley in Darlinghurst, Australia.